WASHINGTON—Because of the District of Columbia’s unique relationship with Congress, the city’s spending must be approved by Congress. With the federal government shutdown, Congress cannot approve funding for the city’s operations and programs. At the moment, the District government is operating on budget reserves. However, it has already had to delay payment of its obligations, which includes payments to Medicaid healthcare providers and payments to the Washington Metro Transit Authority, according to the mayor’s website. 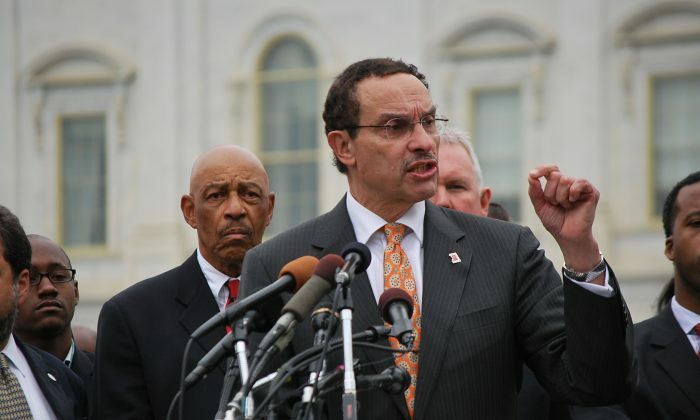 District of Columbia Mayor Vincent Gray and Congresswoman Eleanor Holmes Norton passionately called for Congress to grant the District of Columbia budget autonomy at a press conference on the East Lawn of the U.S. Capitol on Oct. 9. House Oversight Committee Chairman Darryl Issa (R-Calif.), District Councilman Kenyan McDuffie, and community leaders also spoke in support of Congress releasing the District’s funds. Citing that the reserve funds will soon be depleted, Mayor Gray demanded that the federal government “Free us so that we can spend our own money.” During the federal shutdown that began in 1995 and ended in 1996, the District government was granted an exemption after 5 days, according to the mayor’s website. Now into the 10th day, the Government shutdown is affecting organizations in the District that provide social and medical services to District residents. The Maria Center is a community-based health center that provides medical and mental health services to low income District residents. According to Dr. Julie Martinez Ortega, board chair of Mary’s Center, the organization is the second largest non-profit serving Medicaid patients in the District, behind United Healthcare. Mary’s center receives funding from sources that include the District government and the U.S. Department of Health and Human Services (HHS). Gates and a group of adult participants in ADTI’s program brandished signs at the press conference that read “Please release DC Funding.” ADTI receives funding from Medicaid and District agencies that include the Department of Disability Services, Gates said. President Obama was notified of the potential effects that the federal shutdown would thrust upon D.C. residents in a letter from Mayor Gray. Mayor Gray sent the letter on Oct. 8.